-The event is to take place in Dementlieu, Port-à-Lucine. Participants should be aware of expectations of the culture. Caliban while not turned away, might encounter some issue. -Clarifications on the "no activation" rule are as follows: If your cloak has Uses/Darkness a day, then it can only be worn, and the darkness cannot be used. The same for any other item goes. -A weapon with innate qualities like Daze/Stun/Etc. 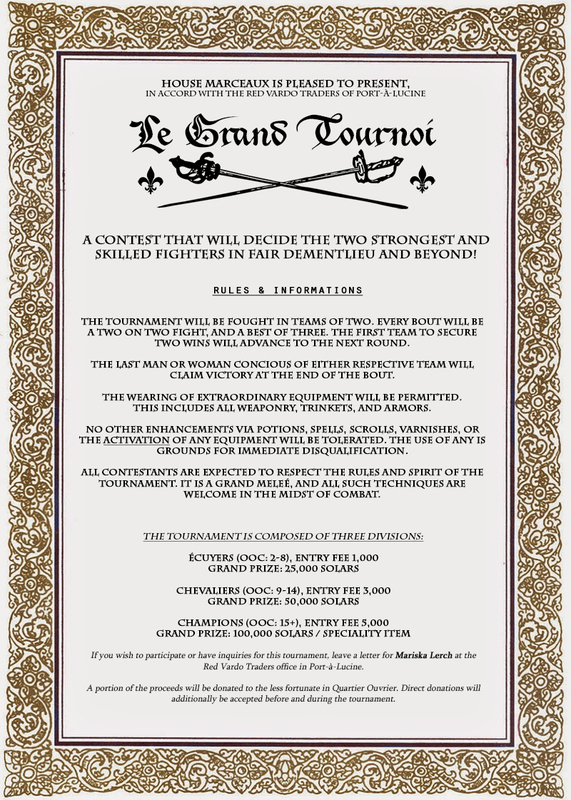 is within the rules of the tournament. Though be wary of blatantly evil weaponry. -If it wasn't obvious, no ranged combat/weapons. **A bracket may be added later, below. 2h30 to this guys! See you there!